Manufacturer of a wide range of products which include heading machine. 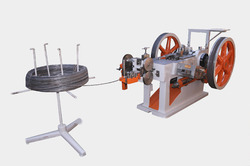 We are one of the trusted manufacturers, exporters and suppliers of precisely designed and developed Heading Machine. Proposed assemblage is manufactured from advance technology based machines, at our location. Owing to the rugged construction, longer functional life and consistent operation, this series is vastly asked for. High speed machine provides great saving of labour and lubrication cost which upgrades productivity and gives a competitive edge. Looking for High Speed Heading Machine ?